Jackrabbits are five separate species native to the deserts and scrublands of western and central North America. Though their name might suggest otherwise, jackrabbits are not in fact true rabbits. These long-legged and long-eared animals are actually hares—meaning that they were born completely furred, as opposed to the naked-born rabbits. Because of the hot desert environment in which they live, jackrabbits have developed a number of adaptations designed to keep them cool. The most remarkable of the jackrabbits' desert adaptations is the structure of their large ears. The skin of those ears is thin and full of blood vessels. 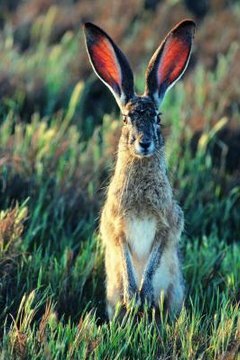 When temperatures start to rise, jackrabbits can regulate the flow of blood through their ears by dilating their blood vessels. This allows heat to escape into the air around the jackrabbit, cooling it off in the process. Jackrabbits also have an adaptation for dealing with hot desert sands—fur-covered feet. The soles of a jackrabbit’s front and hind feet are covered with a layer of fur. While you might think that extra fur would make the jackrabbit warmer, it actually protects and insulates the delicate soles from the heat of the ground. The rest of a jackrabbit’s fur also serves as a desert adaptation. The light silver-and-tan fur provides plenty of desert camouflage, in addition to absorbing less heat than dark fur would. Water is essential for keeping cool when temperatures soar, and jackrabbits have developed ways of conserving water in a habitat where it is often a scarce resource. Along with getting most of their required water from the foods they eat (cacti, leaves, grasses and twigs), jackrabbits have also developed another water-retaining adaptation. After their food has been digested, jackrabbits will often eat their feces. In this way they are able to digest their food twice, getting as much moisture from it as possible with little extra effort. One of the main ways jackrabbits keep cool in their desert climate is simply by staying out of the sun during the hottest parts of the day. Jackrabbits take advantage of the cooler nighttime temperatures by being largely nocturnal. During the daylight hours they will lie crouched in shady areas, in tall grass and weeds or even shallow burrows. Pacific Northwest National Laboratory: What about Jackrabbits?